EYE MAKE UP ROUTINE | RAWR BOWS. Hello! Today's post is all about my eye make-up. Now, I am no make-up artist and I've never really been quite artsy, which is why I don't do anything fancy when it comes to make-up. The very few times I've tried to be all professional it's gone quite wrong so I like to keep it simple. 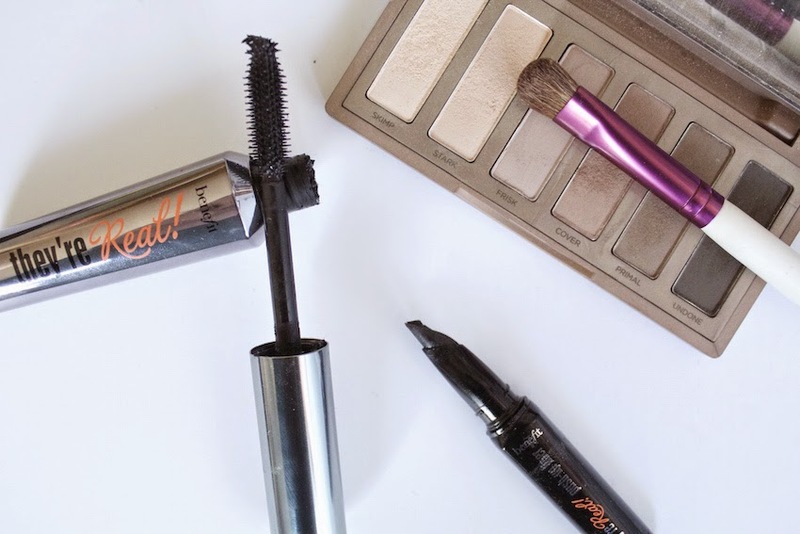 Most days I apply mascara and I'm good to go but that would be a very boring post, wouldn't it? Instead of telling you what I do on an every day basis (i.e when I wake up late and need to sort out my face in less than 5 minutes), I'm going to show you what I do when I have bit more time. FIRST. All of the eyeshadows I use are from Urban Decay's NAKED 2 Basics. I use the white brush to blend 'Stark' all over my lid, this makes my lid a bit lighter and makes me look less sleepy. SECOND. I use the same brush to put 'Frisk' on the outer corner and blend it very well. THIRD. I take a smaller brush to put the lightest colour - 'Skimp'- on the inner corner. This really makes me look much more awake. FOURTH. Then, with a pointy brush, I take some 'Undone' underneath my eyes. Making sure I only have a tiny bit on my brush because I just want to slightly darken my lower lash line. FIFTH. I use Benefit's They're Real Push-Up Liner to line my upper lash line. Then I apply a few coats of Benefit's They're Real Mascara and I'm good to go! What's your go-to make up look?